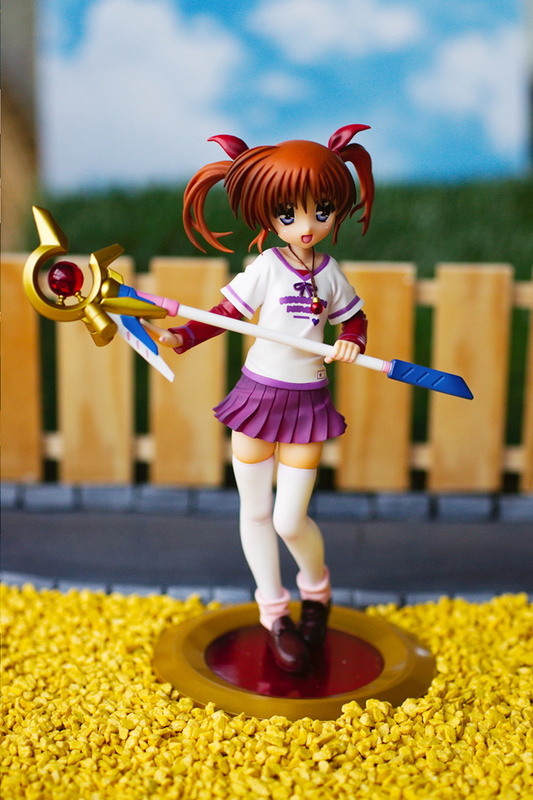 Lately cute figures really became my weakness, you could say that they are my kryptonite. After I regained my consciousness I waited well-behaved for the opening of the preorders. 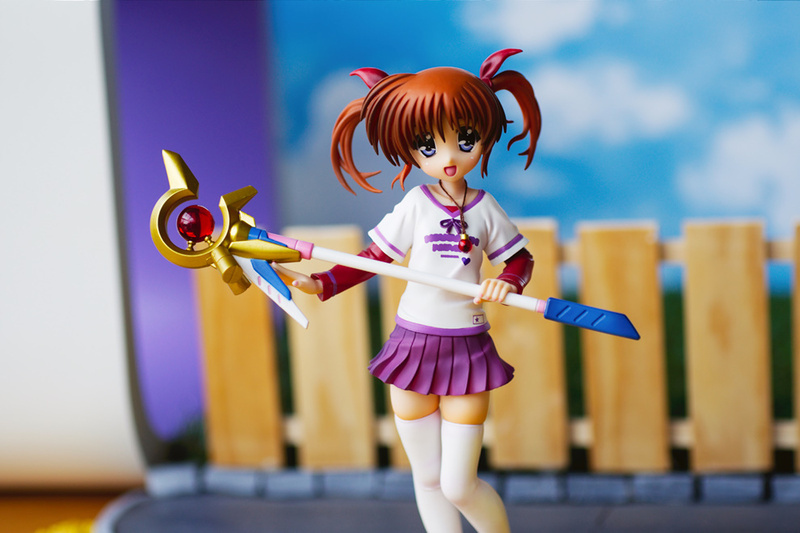 Without giving it a second thought I just ordered my Nanoha figure. 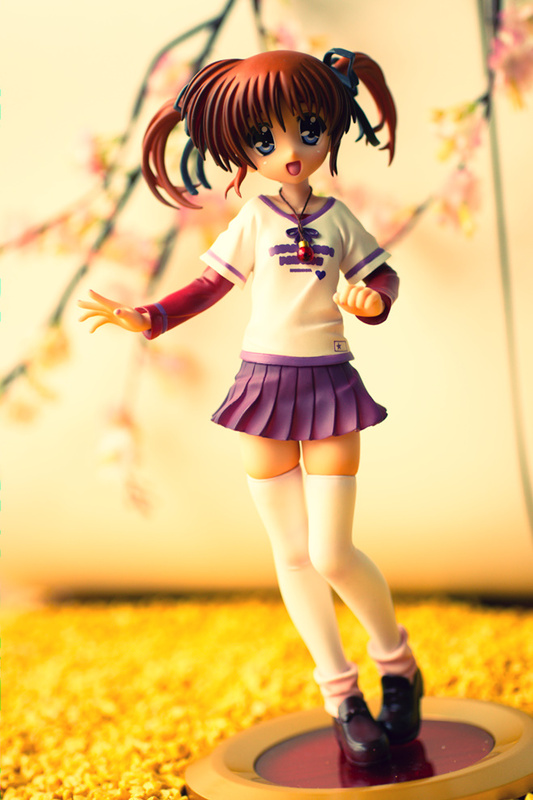 I haven’t bought any figures of Nanoha so far, but I found this casual cloth version of her pretty appealing. by Seven Arcs it was aired from October to December 2004. So far there weren’t many movie adaptions of animes that I liked a lot, I always felt that something important was missing, often the plot was too rushed or the movies can’t really cope with the atmosphere and flair of the anime in the end. 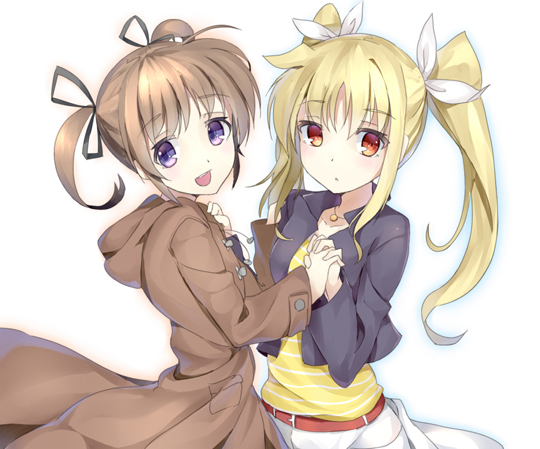 In the Nanoha movie the plot centers on the really important parts and captured the atmosphere of the anime very good. 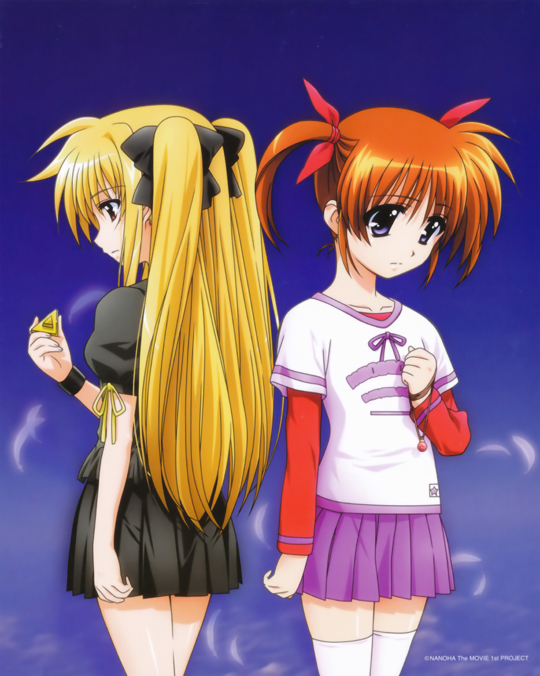 Also the pacing of this Nanoha movie was very well done in my opinion that was a really good movie. I hope that a subbed DVD of this movie will come out soon I would definetely buy it. she became a Magical Girl by chance as she wanted to save the young mage named Yūno from an evil monster, I won’t spoil any farther infos about th story just watch it, it’s good. her size fits very well to my other 1/8 scaled figures, it looks like they are her Onee-chans 😀 . 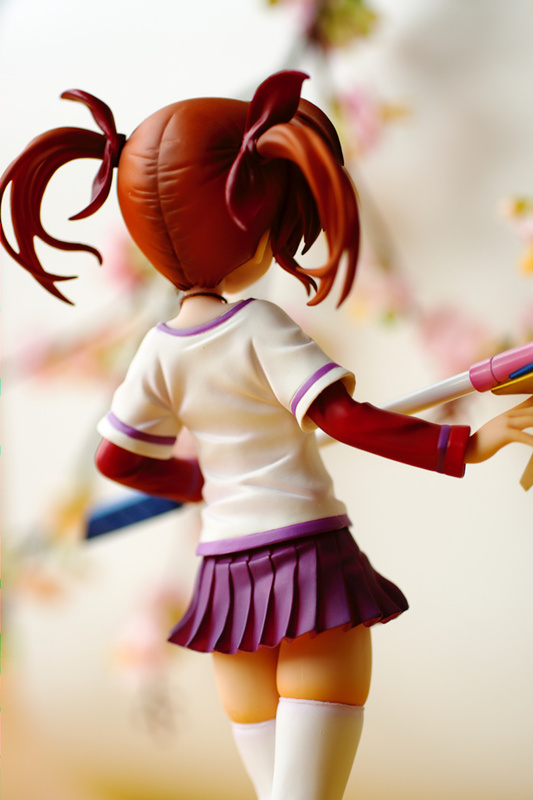 In general younger characters like Hachikuji Mayoi from Kotobukiya or Sanade Yukimura from ALTER look a bit big for their age and in comparison with other characters from their origin. a Raging Heart amulett, the Raging Heart device and a nice base. On MFC the version is called “casual clothes version“. 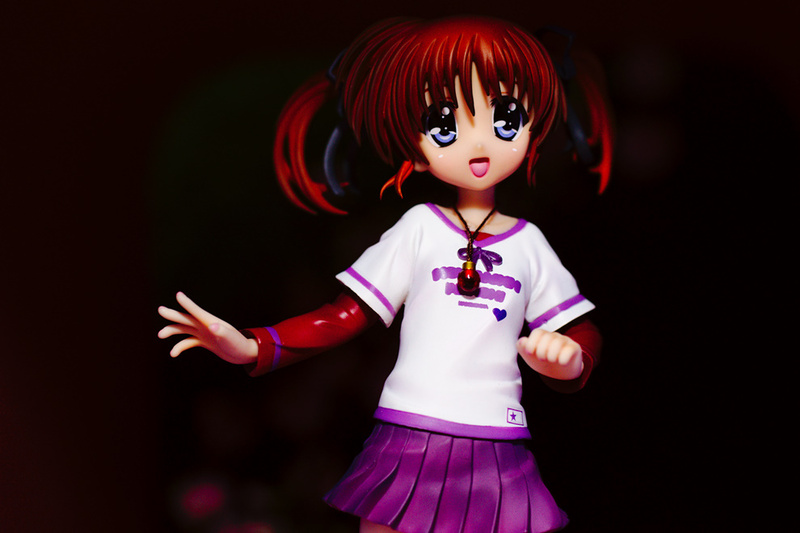 but in the end Kotobukiya named it “everyday wear“, to me that sounds not as cool as casual clothes version. In the anime show her casual clothes weren’t that flashy like in the movie I guess kids these days dress themselves in a more stylish way. 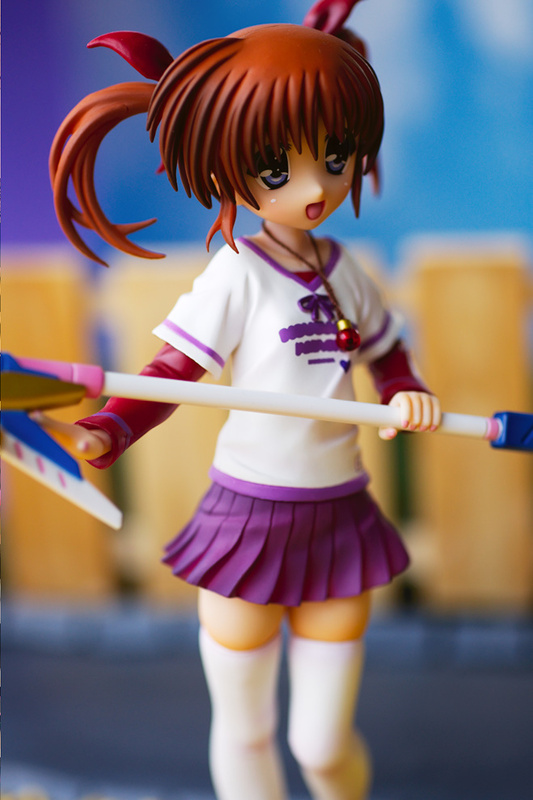 Nanoha has a foxred haircolor with dark shading effects at the places where it is necessary, the hair has detailed strands and ribbon parts, everything looks nice and cleanly sculpted. The interchangeable twintails are a nice feature, you can choose between the big red ribbons and the finer black ones, which Fate gave her in the movie. The shape of hear head matches with her origin the same goes for the detailed painted eyes, together with her open mouth the face shows a very happy expression, I would say Kotobukiya did a good job with her face. 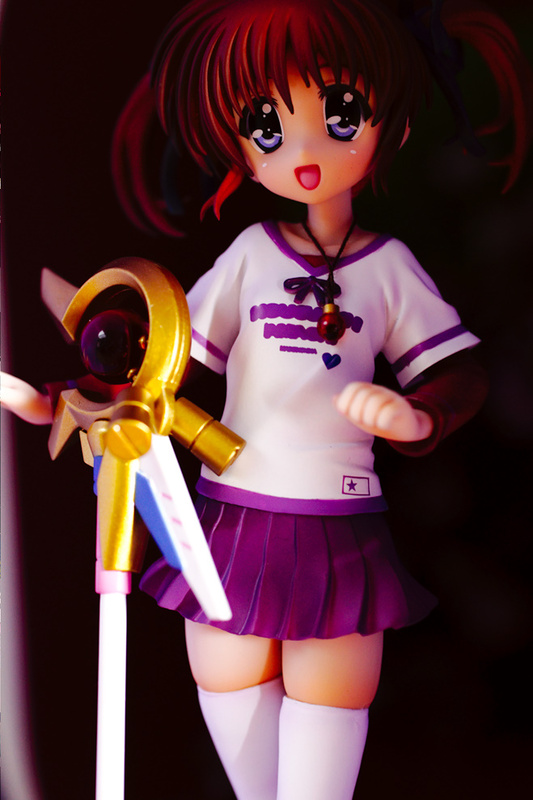 As mentioned earlier I really like Nanohas stylish dressup the white T-shirt with these purple elements and the red long sleeved shirt underneath are a very nice combination. The short purple skirt buckles and has a nicely sculpted flow, the dark shading let it appear somewhat lively and realistic. 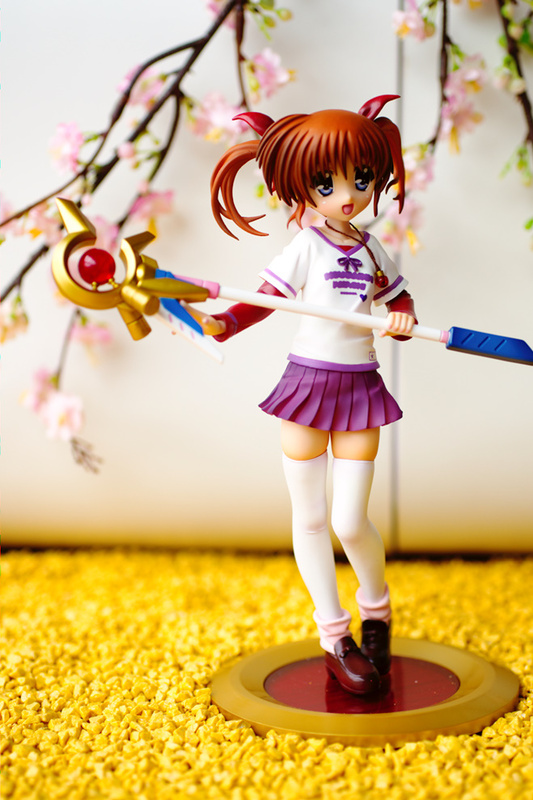 Well, the skirt is castoffable, but come on she’s just 9 years old, I like Nanoha, but not in that way XD. Anyway back to the clothes, at her legs she wears white stockings with crumpled light pink colored socks at the bottom, as footwear she wears shiny brown shoes, it is the model you see a lot in school animes. 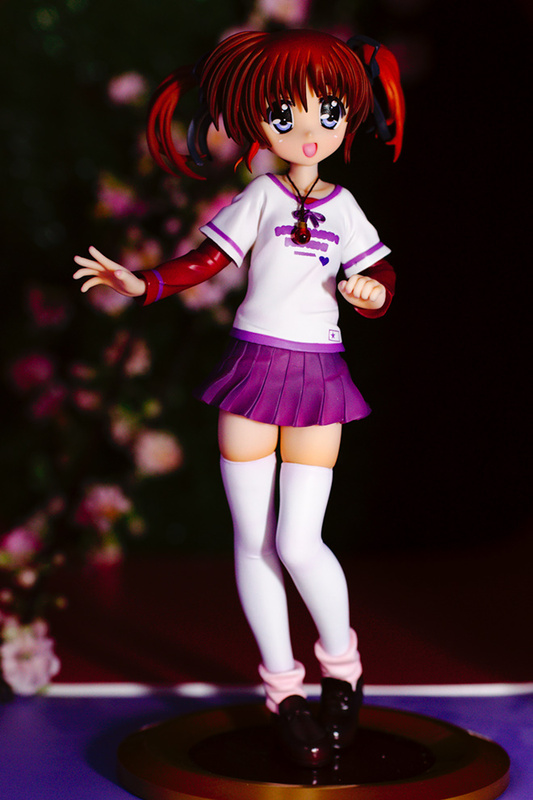 It is really nice how Kotobukiya sculpted her clothes, everything especially the realistic looking wrinkles at her shirt, the skirt and the loose socks are very pretty. The Raging Heart amulett around her neck is a nice accessory, the gold with the clear red pearl looks pretty, it is attached to a real cord and so it can be moved freely. 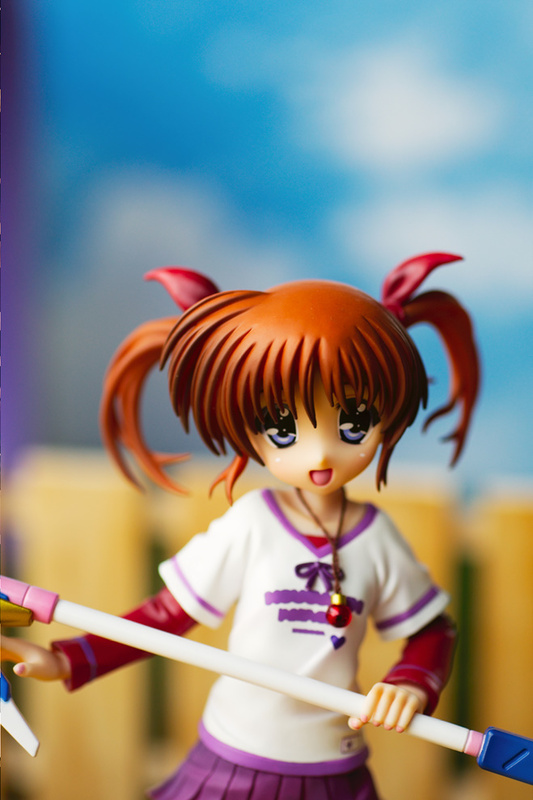 The figures from Kotobukiya that I own have no very nice looking bases, but the base of this Nanoha figure looks very good. The outer golden ring with the shiny metal finish and the transparent red circle in the middle are a good combination. 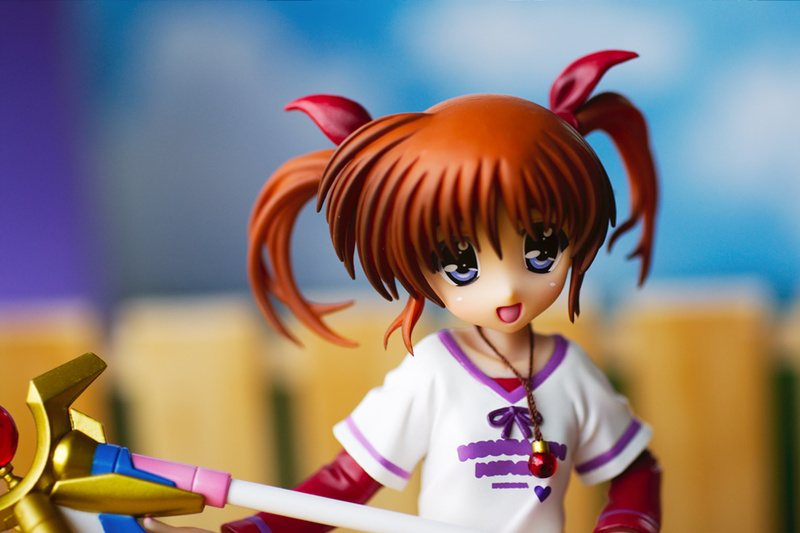 Nanoha is a very cute figure, in her casual clothes she looks very good and after all the figures of her where she is always in her barrier jacket, this normal clothes are a nice change. Her eyes have pretty highlights and appear very lively, regarding her small size the paintjob and the shading effects are really well done. Her clothes are also very pretty and very well sculpted, on a very close look I could find one small bump mark at the side of her left stocking, overall the quality of this figure is very good. 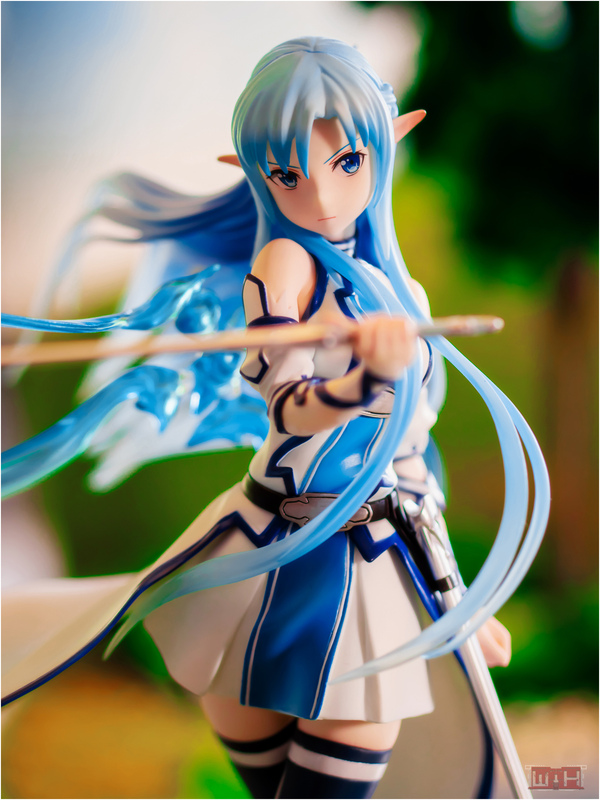 What do you think should I order the Fate – casual clothes version from Kotobukiya as well? Alters Version looks nice as well , but I prefer the casual clothes. I haven’t seen this outfit from her before. It looks cute. 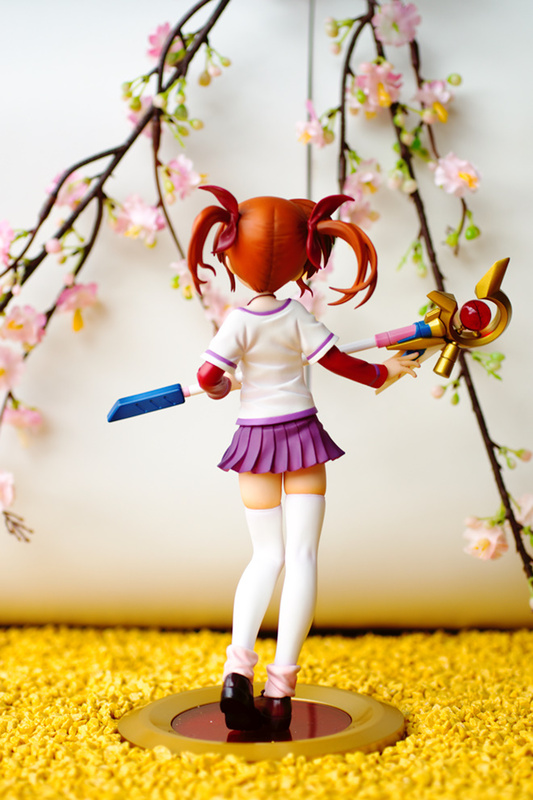 The castoff skirt option is kind of dodgy though, haha.